For the last two years, Dorothee, who works in a rice field and makes handicrafts in Madagascar, has been the main provider for her family. Her husband used to be a fisherman until an injury prevented him from getting into the water. They have one son and four daughters, and her income isn’t enough to cover school fees for all her children. 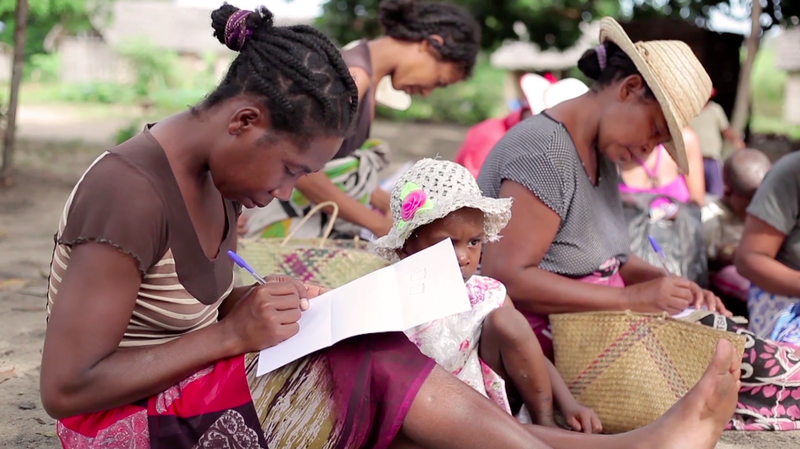 The Government of Madagascar started the Human Development Cash Transfer program in 2016 to help families with children up to 12 years old cover necessities like school fees and healthy food. The program provides cash to more than 100,000 female heads of household like Dorothee on the condition that their children enroll in and attend primary school. Cash transfer programs like the one in Madagascar have been proven to reduce intergenerational poverty by helping children get more years of education, supporting their health and nutrition, and promoting productive family activities. Before receiving these cash transfers, Dorothee only had enough money to send her son to school—now, two of her daughters attend as well. The cash relieves some financial strain from Dorothee’s family and thousands of others. However, as with anyone managing money, it is difficult to plan how to use it in the short and long term—not because she doesn’t know what’s best for her family, but because living in poverty can hinder a person’s ability to take the very actions needed to plan effectively, such as assessing risks and avoiding tempting purchases. Additionally, many people earn their living through farming, meaning there are times each year when they’re not producing crops and have reduced cash flows, and planning for those times can be difficult. The inclusion of more supportive planning tools could give cash transfers the potential to help improve families’ livelihoods and futures even more than they already do. We know from behavioral science that like any other product or policy design, effective planning tools must take into account the way that people actually act and interact in the real world. That’s why, with support from the World Bank, we interviewed cash transfer beneficiaries to learn about how they make decisions about using their cash, and what kinds of tools would help them achieve their goals. Based on these insights, we designed a behavioral intervention that is delivered every two months right before the female heads of the household collect their money. In the design, groups of women collecting their transfers go through an exercise in which they set goals for what they hope to do with their cash and share their goals (and progress) with each other. This serves the dual purposes of both strengthening their accomplishments and community bonds. In one of the exercises, women are given a set of four cards with pictures of major purchases they could make with the transfer (related to education, nutritious food, savings, or hygiene). They are then asked to choose a “primary” identity (for instance, being a mother) and how it is influencing the way they make decisions. After this they rank the cards based on which expenses they feel are most important to them based on their chosen identity. Finally, there is a group discussion about the identity exercise. We will share the broader results of our goal-setting intervention this fall, but we’re already hearing promising anecdotes about positive changes from participants. With a recent cash transfer, Dorothee bought a pig that she will raise and sell later in the year to improve cash flow at a time when funds would normally be tight. She told our team that the sessions have already helped her prioritize household expenses in this way, based on what she feels is important for her and her family. “As a mother, it is my responsibility to make sure that my children are happy,” Dorothee said. She herself received only three years of education as a child because her parents couldn’t afford to continue her schooling, but she has high hopes for her own kids. “My dream is…that they get their bachelor’s degree,” she said. Making cash transfers as effective as possible for the people receiving them using features built from behavioral science doesn’t only alleviate strain on families today, it also can help parents create new opportunities for their children’s future, a critical step toward ending intergenerational poverty.